KIEV, Ukraine -- Ukraine’s failure to enforce its own ultimatums and its appeal on Monday to the United Nations to send peacekeepers laid bare a grim reality for the shaky government in Kiev, where political leaders and security forces have few reliable ways to confront Russian-backed separatists in the restive east. U.N. leaders discuss Ukraine crisis. A deadline set by Ukraine’s acting president for the start of a “large-scale antiterrorist operation” in the east passed without any clear police or military intervention. Meanwhile, pro-Russian militants seized yet another government building in the Donetsk region, bringing to at least nine the number of eastern towns now swept up in an insurgency. The country’s acting president, Oleksandr V. Turchynov, asked the United Nations to send peacekeepers. But the move was widely viewed as an act of desperation, given that Russia holds a veto at the United Nations Security Council and is unlikely to assent to a such a request. The confused and passive response underscored Kiev’s limited options in challenging pro-Russian militants and their backers in Moscow. Too assertive a response could cause heavy civilian casualties and play into Moscow’s narrative that Russians and Russian speakers in Ukraine are threatened and need protection. Too timid a response risks inviting more meddling from Moscow or giving free rein to local armed militants. Ukraine’s armed forces, demoralized and underequipped, are so short of funds that when the government ordered them on high alert last month as Russian forces seized Crimea, a Ukrainian billionaire had to buy the military fuel. The businessman, Ihor Kolomoysky, now the governor of the Dnipropetrovsk region next to Donetsk, said he put up around $5 million of his own money to pay for gasoline and batteries so that Ukrainian military vehicles could leave their garages and helicopters could get off the ground. Ukraine’s intelligence agency, the State Security Service, known as the SBU, is so riddled with Russian informers that when John O. Brennan, the C.I.A. director, visited Kiev over the weekend on a supposedly secret trip, Russian state news media swiftly revealed his visit and declared it evidence that Washington was calling the shots in Ukraine and pushing for a crackdown in the east. Even Alfa, an elite Ukrainian special forces unit that takes pride in taking on perilous missions, has appeared feckless in its response to the unrest in the east. It lost an officer on Sunday to gunfire, apparently from the pro-Russian side in Slovyansk. The force has made no headway since in entering the city, never mind freeing government buildings there from unidentified gunmen. As with other arms of Ukraine’s security and intelligence services, some members have divided loyalties and seem disinclined to engage in a fight against pro-Moscow militants that would put older women and other residents who support the gunmen in the line of fire. Alfa, under investigation for its role in cracking down on protesters in the capital during the uprising against the ousted president, Viktor F. Yanukovych, did not deploy, as expected, to remove pro-Russian militants from Slovyansk on Monday. The government’s failure to take back control of Slovyansk and other eastern towns has humiliated and infuriated Ukrainians who had hoped that the ouster of Mr. Yanukovych would allow their country to move out of Moscow’s shadow toward Europe. “We have been left defenseless,” shouted a uniformed Cossack from a stage in Kiev’s Independence Square, the focal point of three months of protests against Mr. Yanukovych and now a magnet for those unhappy with what has happened since he fled to Russia in February. “I ask the government to give us arms — what we need is this,” he said, waving a Kalashnikov rifle to cheers from the crowd. Photographs posted on social media websites on Monday showed Ukrainian tanks purportedly on the main road north of Slovyansk, suggesting that the Kiev government was gearing up for a counterattack or at least a show of force to appease critics who say that it has not done enough to protect eastern Ukraine from the fate of Crimea, which Russia annexed last month. The rebellion in Donetsk and other eastern provinces presents Kiev with a choice of using extensive force that might only expand so far modest public support in the east for the militants or of simply pleading for calm, a course that has so far only emboldened the pro-Russian rebels. It is a dilemma that would not be easy even if Ukraine had a loyal security and military machine, but not having one makes the choice far more difficult. 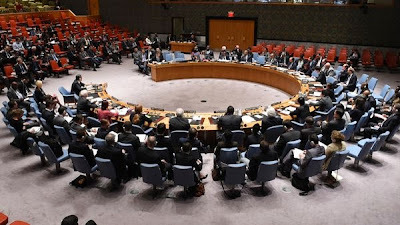 The plea for help to the United Nations was highly unlikely to be met as Russia, a permanent member of the security council, would almost certainly veto any move backed by the West to send peacekeepers. Russia agreed last month to let the Vienna-based Organization for Security and Cooperation in Europe send monitors to eastern Ukraine, but they confine themselves to writing reports. All this leaves Ukraine largely on its own to fight off a well-coordinated campaign of attacks on government buildings that it denounces as Russian aggression but that it has so far been unable to prove incontrovertibly involves Russian soldiers, agents or money. But if Russia is indeed now seeking to repeat its Crimea seizure, something that Moscow has repeatedly denied, Ukraine’s defenses are fragile. So, too, is the government amid rising public anger at its inability to keep the country together. After another day of bleak news from the east, protesters set tires on fire late Monday outside the Parliament in Kiev. They demanded that the acting interior minister, Arsen Avakov, resign and that Mr. Turchynov explain why things have gone so wrong. The SBU, under new leadership since Ukraine’s February revolution, has repeatedly boasted of catching people suspected of being Russian operatives in the east, but it has not yet made public any solid evidence to support Kiev’s assertions that the mayhem in Donetsk and neighboring provinces has been orchestrated and financed by Moscow. This has left the Russian foreign minister, Sergey V. Lavrov, free to taunt Kiev and the West for making accusations they have not yet substantiated. It has also compromised Ukraine’s efforts to compete, at least in eastern Ukraine and in Russia itself, with Moscow’s own narrative of Western meddling. Alfa, by contrast, does appear to be more or less functioning, but its officers, bitter at being challenged over their role under Mr. Yanukovych, do not understand when “you tell them one day that they are murderers and then send them the next day to free a building” in Donetsk, said Serhiy Skorokhvatov, a former officer in the force and president of its veterans association. Like other police and special forces units, Alfa took part in what Mr. Yanukovych called an “antiterrorist operation” and worked to crush the pro-European protests that brought the current government to office. Oleh Prysizhniy, who headed Alfa until Mr. Yanukovych fled, is under investigation by both Parliament and the prosecutor general for the unit’s possible role in killing protesters. Ordered on Sunday to retake the town of Slovyansk, Alfa quickly backed off the mission after one of its officers was shot and killed as he walked away from negotiations with the rebels. A full-scale assault by Alfa, Mr. Skorokhvatov cautioned, might free the occupied Slovyansk police station but would not end the crisis. “Alfa is a scalpel, but it is impossible to use it cut down a tree,” he said. Many of the senior security officials who served Mr. Yanukovych have been dismissed and, in some cases, have fled to Russia, but the legacy of more than two decades of close cooperation between Kiev and Moscow on security issues remains embedded in a security apparatus established and controlled by Moscow under the Soviet Union. Such links raise questions about loyalties. Among those who took refuge in Russia is Alexander Yakimenko, the former head of Ukraine’s State Security Service, the post-independence successor organization to the Ukrainian branch of the K.G.B. While Mr. Yakimenko is gone, the agency he left behind is infested with informers and agents whose loyalties lie more with Moscow than Kiev. “We can’t change this overnight,” said the deputy defense minister, Leonid Polyakov. This helps explain why Ukraine’s government has been caught flat-footed repeatedly by events in the east, where buildings that were obvious targets for attacks by pro-Russian militants were left guarded by just a handful of local police officers, who, outnumbered and outgunned, often ran away. Independence Square in Kiev has echoed in recent days with angry denunciations of the authorities for their failure to crush separatists in the east and calls for citizens to take up arms to defend the country. A recent opinion poll in Donetsk suggested that less than a third of the population wants to join Russia, far less than the proportion that wants Ukraine to remain intact. Donetsk residents who support Kiev increasingly wonder why a pro-Russian minority has been able to run amok. “The ball is now on the side of Kiev,” wrote Oleksandr Honcharov, a lawyer from Donetsk, on his blog.